Schools Week has reported on the GCSE Science Consultation response from Ofqual with a comment from Richard Needham @viciascience on the proposed percentages of maths examinable content: 10% Biology, 20% Chemistry and 30% Physics. Now I don’t know the full mechanics behind developing exam questions and how these percentages will correspond to marks however it seems to me that these percentages are biased unnecessarily towards Physics. Physics is traditionally thought of as being the subject with the most mathematics content due to the number of formula required, and in the new GCSE content, this requirement has become much stronger with an increased number of formula, and requirement to commit most of these to memory. However once a formula has been recalled or selected the use of it doesn’t require any extra mathematical knowledge to use it (except perhaps rearranging, and more complex formula with squared terms). Contrast this will biology where students have to have an understanding of statistical techniques which aren’t used in the other two single science subjects. 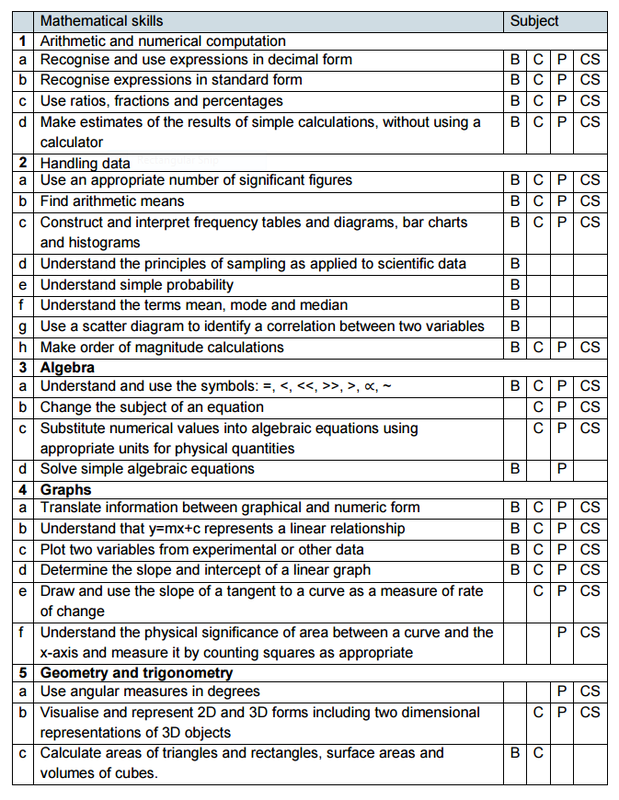 Here is the breakdown of mathematical requirements and how they contribute to the subject content at GCSE. There are 19 requirements for Biology, 18 for Chemistry and 20 for Physics. They seem evenly distributed and this doesn’t correspond to the 10%,20% and 30% split. I am interested in your opinion of how import you feel each requirement is to the individual subject? I have prepared a questionnaire to collect this information, which I plan to share with Richard and use to form some collective response from #ASEChat teachers to the consultation. It will take some time – but I would appreciate it if you would spend some time thinking about it. The questions are all the same for each requirement – Rate how important it is to examine this aspect within each subject. Please rate from 0 – Not important (i.e. it’s a general mathematical skill, no special reason to examine within this science subject) to 4 – Very important (i.e. it underpins aspects of scientific understanding within this science subject). I realise this is a big ask during your Easter Holiday. I estimate it will take around 15 – 30 mins depending on whether you leave extensive comments. Why do we examine maths and English separately from other subjects? Because knowing someone is good in one and weak in another is useful. Separate examining tells us about strengths and weaknesses but it won’t do if the limiting factor is always one thing. It would be stupidity of the highest order to have the maths in physics harder than the maths in maths (arguably even as hard) because then the common grading system is meaningless and we get less more than more information about what the candidate knows and can do. Far better to work out the mathematical attainment most grade C candidates can be expected to have and pitch the maths naturally in SCIENCE questions at that level rather than worrying about examining the maths.